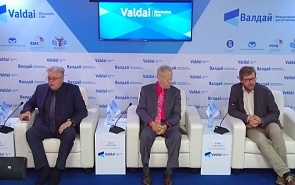 On September 7, 2018, at 11:00, the Valdai Club hosted an expert discussion on the current state of the US-Russian relations. Although the Donald Trump-Vladimir Putin summit in Helsinki was a landmark in bilateral relations, it did not break the general line of Washington towards Moscow. Sanctions and political pressure are increasing. In spite of planned high-level contacts there is a great risk that they will bring the opposite results. What are the prospects of the Russian-American relations? Is it worth waiting for “warming” after the November midterm elections to the US Congress? How prominent are the issues of strategic stability and security on the Moscow-Washington agenda? How can the situation around New START be resolved? These and many other issues were addressed by the expert discussion participants. Valery Garbuzov, Director of the Institute of the USA and Canada of the Russian Academy of Sciences.